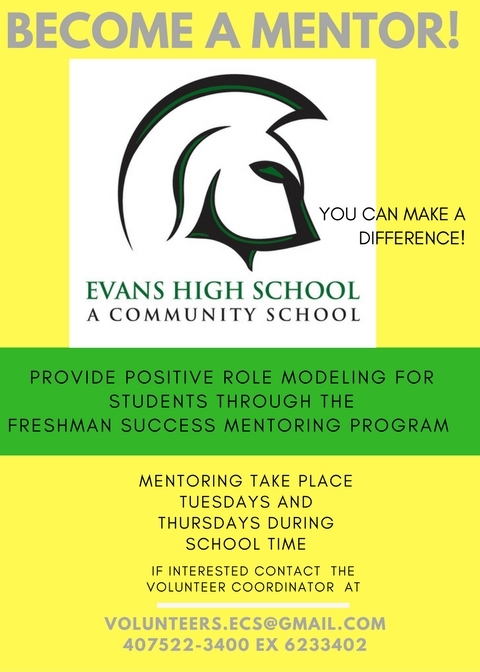 We welcome volunteers who are committed to helping Evans students be the best they can be. Volunteer opportunities include serving as mentors, tutors and chaperones. Welcome current and prospective volunteers! To be a volunteer, please follow the instructions below. This process is FREE for volunteers. Visit http://volunteer.ocps.net and complete an ADDitions application. Check this website for the status of your application as well. Contact Mrs. Casey Waugh at casey.waugh@ocps.net to notify her that you’ve completed an ADDitions application. Also indicate your proposed start date if you have one. Mrs. Waugh will monitor your clearance status. Please allow one to four weeks for proper clearance. If you’ve volunteered for OCPS before, you must renew your ADDitions application annually. If your ADDitions application is current and for another school, you can update your application for Evans through the ADDitions website. If you are an OCPS employee, you must complete an ADDitions volunteer application and renew it annually as well. Note: Orange County Public Schools is required to conduct criminal history background checks on those wishing to volunteer. A list of criminal offenses that may disqualify an individual from serving as an OCPS volunteer is provided on the volunteer website (http://volunteer.ocps.net). All individuals who are tutoring as a part of a field-experience course requirement must adhere to “intern” guidelines.